Rappers LL Cool J and Ice Cube in talks to reportedly buy 22 sports networks from Disney as the company looks to divest the stations for approval of its 21st Century Fox acquisition... 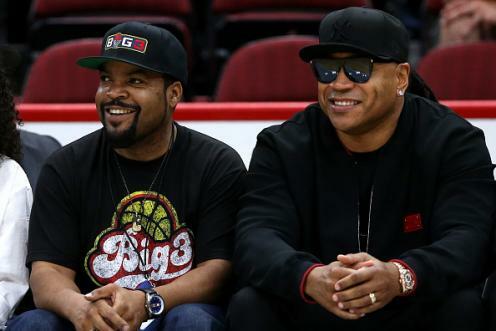 Co-Founder and entertainer Ice Cube sits with rapper LL Cool J during week two of the BIG3 three on three basketball league at United Center on June 29, 2018 in Chicago, Illinois. Rap heavyweights LL Cool J and Ice Cube may be coming to a sports channel near you. The music marvels are quietly courting 22 sports stations with the intention of buying them, according to TMZ Sports. The 22 channels are up for grabs as Walt Disney Co. (DIS) looks to divest them from its network portfolio as part of the Justice Department order for approval of its 21st Century Fox acquisition. Disney picked up sports channels YES Network, Fox Sports San Diego, Fox Sports Arizona, Fox Sports Detroit, and Fox Sports Southwest, to name a few, as part of its $71 billion 21st Century Fox purchase. But the Justice Department has other plans for the company, which is also a majority owner of ESPN. Disney must sell off the 22 sports channels to avoid a monopoly of the sports TV market. The New York-based YES Network was a boon for Disney as it holds the rights to air the New York Yankee games. According to The Wall Street Journal, Disney reportedly wants $5 to $6 billion for the YES Network, with a total package deal for all 22 stations anticipated in the $15 to $25 billion price range. While bidders for the sports stations run the gamut from private equity firms Apollo Global Management to the Blackstone Group and Sinclair Broadcast Group, the real interesting buyers are LL Cool J and Ice Cube. The pair has also found themselves a partner to sweeten the deal with Carolyn Rafaelian – billionaire founder of Alex and Ani jewelry, according to TMZ. The group is reportedly in talks with other sports and media starlets that may be interested in joining in on the bid for the sports channels.